For nearly a century our New Zealand customer has held an unwavering commitment to sustainability and today is a renowned manufacturer of glass bottles, jars and packaging solutions to the world’s leading brands. For many years their New Zealand operation was utilising 12mm x 200mm rubber skirting on the conveyor chute and full length of conveyor. 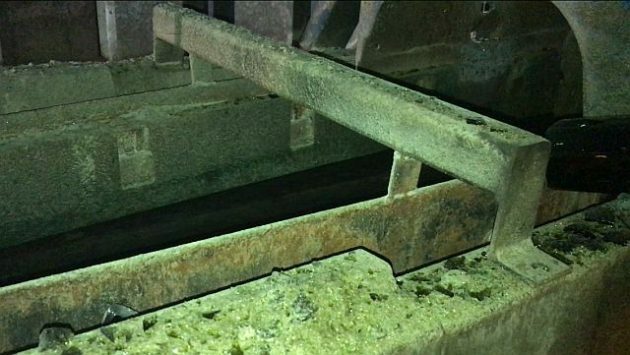 The impact and highly abrasive nature of the conveyed crushed glass meant the rubber skirting was prone to substantial wear and tear, particularly around the conveyor transfer point. On most occasions, the rubber skirting delivered an unsatisfactory product life of only a couple of months. In addition to this, frequent worn skirting was the leading cause of belt mistracking – this required urgent rectification to prevent major interruptions to daily production schedules. Production down-time was scheduled in to replace worn skirting as well as fixing belt tracking issues when identified. Other challenges encountered on site included conveyor belt failures, noticeable wear on head drum lagging, impact bars and steel trough rollers due to glass ingress in belt covers. After collaborations with Kinder technical applications team, improving productivity on site was high on the agenda and K-Containment Seal conveyor skirting and sealing solution was recommended and installed without hesitation and delay. K-Containment Seal, features a high performance, low friction engineered polyurethane, delivering exceptional resistance to wear being a key feature. On this occasion, K-Containment Seal was primarily installed to match the existing belt trough angle. Since the initial K-Containment installation, it has proven highly effective in minimising wear pattern/s developing from a build-up of fines under the skirting seal which can ultimately lead to groove patterns around the conveyor belt surface. K-Containment Seal also played a vital role in centring the conveyed glass material and dramatically improved the wear on the skirting. Twelve months since the installation of K-Containment Seal, Maintenance team are delighted to report that “no conveyor belt change out was necessary”, the entire installation process was conducted trouble free and a huge success for their New Zealand operations. The conveyor system continually runs at optimal levels and performance with virtually no production down-time. The interval between conveyor components replacements (impact beds and rollers) have all been all been extended and components lasting much longer than prior to K-Containment Seal installation. The New Zealand operations are now realising positive outcomes as a direct result of the K-Containment Seal installation. Addressing the primary issues of excessive skirting wear has also had a positive flow on effect on belt tracking. The resultant major reduction in product wastage and material spillage improves the operations bottom line, i.e a reduction in cleaning up costs and averting potential OHS safety hazards associated with conveyed material spillage ending up on the ground. Due to the K-Containment’s success in delivering on-site reliability and productivity, Maintenance Team have confirmed plans to implement an identical conveyor skirting and sealing solution onto their sister conveyor system on site.